In the News: Financing Your Land and Home – A Bare Land Loan or a Home and Land Package? Ryan Craig enlisted in the Army on March 5 of 2008. He was soon deployed to Iraq, and seven months later returned safely to the States. Ryan’s second deployment sent him to Afghanistan, where in his words: “We hit the ground running and were under fire daily.” Ryan and his platoon had logged several safe returns from missions accomplished, but while out on patrol on November 19, 2010, the men were caught in a deadly ambush. In response to enemy fire, Ryan positioned himself to return fire and allow his fellow soldiers to get to safety. His selfless actions marked him as a target, and he sustained an injury that would change his life forever. Ryan’s helmet was penetrated by a large-caliber round that fragmented, damaging both frontal lobes of his brain. His sacrifice would leave him severely impaired. It was not expected that Ryan would survive. Following his injury, he underwent multiple surgeries to repair the damage he incurred, suffered three strokes and battled a life-threatening brain infection. After two years of rehabilitation he was able to have reconstructive surgery performed on his skull. Having proven time and again that he is a survivor, Ryan is now receiving treatment for thyroid cancer. Currently, Ryan lives with severe cognitive impairment and requires 24-hour care. At 29 years of age, Ryan’s cognitive ability makes it challenging to navigate his day-to-day activities without assistance. Ryan’s family has set out to build a comfortable, safe home that will allow them to care for Ryan while providing him with the independence and quality of life he deserves. Jennifer and Ron Miller, Ryan’s parents, have partnered with New Era Homes to make the construction and completion of this home a reality. Jennifer continues, “New Era Homes helped us design the house and talked about things that we didn’t even think about to make it more functional for Ryan and for us.” The Miller’s fully custom home is essentially two conjoined houses separated by a laundry room. The design would accommodate Ryan and his live-in caretaker on one side of the dual layout while Ron and Jennifer would occupy the other. The Craig’s Heritage level home includes the Uncommon Standards that New Era Homes are known for plus added accessibility features like wider hallways and doors, a zero threshold shower, limited hallway length and easy to use door levers. Standard features like vaulted ceilings, upgraded appliances and fixtures and a top of the line HVAC system provide all the beauty and efficiencies that Ryan and his family deserve in their comfortable new home. Jennifer recalls when she was first notified about Ryan’s injury. “I got a phone call at 5:00AM from the ground troops in Afghanistan that just said my son was injured. They didn’t tell me how bad; they just said that it wasn’t severe enough that I needed to come [to Germany]. They said I would get another call if I needed to come, but if I did, it meant the injury was severe and terminal.” A few excruciating hours later, Jennifer received the call that said she needed to come for her son. Upon arriving at the hospital in Germany, the medical consensus was that Ryan be removed from life support. But Jennifer hoped for a miracle and decided to bring her son home. Other contributing companies include Salute, Inc., Parr Lumber, Consolidate Supply, Moen, Trobella Cabinets, Roofline Supply, Johnson Brothers Appliance, KitchenAid, Cascade Design Center, Globe Lighting, IKO Roofing, Gale Contractor Services, Continental Hardwoods, National Builders Hardware, California Door Company and Mary Doyle with Coldwell Banker. To learn more about New Era Homes, visit www.newerahomes.com or contact Sales Manager, Trent Gardner, at 541-330-5463. Donations for their home can be deposited into an account in Jennifer Miller’s name titled Donation Account for Ryan Craig at any Washington Federal branch or mailed to Washington Federal, 1570 NE Third St., Prineville, OR 97754. Whether you are just starting the homebuilding process and shopping for land, or you have land and are ready to take the next step, understanding the financing process can help save time, money and frustration. We have compiled a few tips to help you prepare for the financial aspect of building a home on your own land. We also met with mortgage loan officer, Jackie Westover at Umpqua Bank, to provide insight on bank requirements that impact loan timing and eligibility. There are two ways to buy land using bank financing: a bare land loan and a home & land package. There are few lenders willing to lend on bare land so this is the most difficult type of loan to secure. With a land loan, a lender will require a significant down payment, limit the loan period and charge a higher interest rate to compensate for the perceived risk of lending on bare land. The most common misconception is that buyers must have the land secured before they can begin the building process. That is not the case with the second type of land financing referred to as a land & home loan package. This loan provides funding to buy the property and immediately begin construction of a new home. The interest rate on this loan is lower, the loan period is usually 12 months or less, the down payment requirements are less and there is only one set of loan fees. The land & home loan has a shorter duration so having a qualified builder in place allows the buyer to get a head start on the budgeting and planning process. This allows construction to begin immediately upon the land purchase and loan closing. The loan process is generally straightforward and less time consuming if the customer already owns their own land. Also, owning land for a year prior to building means the property is “seasoned”. This allows the bank to use any equity in the property to offset the down payment requirements of the loan. It is wise to engage the builder prior to placing a land offer for several reasons. The builder will determine if the property has major services available (water, power, sewer), whether zoning will allow for the intended use and whether there are deed restrictions that will impact construction. The builder will also determine if the land development costs will fit the overall budget and if the property will accommodate the desired floorplan. Part of the lending process is obtaining an appraisal to justify the value of the land or land/home package. For a land & home loan, the appraisal is based on the contract, description of materials, plans, specs and the overall budget including land and development costs. With rising prices in an escalating market, the appraised value may come in less than the land and building costs. A low appraisal means the borrower will need to increase the down payment on the purchase. The best case scenario is that the appraised value comes in, at, or above the cost of acquisition/construction. There are variables that effect the length of time it takes to close on a construction loan but 45-90 days is typical with 60 days being the average. Negotiating a realistic closing date allows the lender, builder and borrower enough time to perform their duties and ensure a smooth closing of the land. Due to tightening lending standards, it is important for the borrower to understand that the amount of documentation to secure a loan is immense. Providing information to the bank in a timely fashion streamlines the process considerably. No matter how budget conscious the planning process is, sometimes things still come up during construction that impact costs. Banks build in a contingency for unforeseen issues; in Central Oregon, we call it the rock clause. While it’s generally used for unexpected permitting or land development costs, borrowers can also access it for upgrades. During the course of construction, upgrades outside of the contract are paid for out of pocket by the homeowner. After the project is completed, homeowners can be reimbursed out of the contingency fund if it hasn’t been used for essential construction and development items. It is important to have the conversation with your builder up front to know how mid-construction changes will affect the process and budget. Today’s underwriting process looks much different then it did 10 years ago. Everyone, regardless of income level and credit score, goes through the same process. However, there are steps you can take as the buyer to help streamline the process. 1. Seek loan preapproval early on. This allows credit, income and assets to be reviewed ahead of time to ensure there are no surprises. 2. Hold onto cash! Cash is often more important during the process than paying off debt. 3. Stay consistent. Keep your job, don’t apply for any new credit or move investment or cash locations. Significant changes can cause a borrower to be denied loan approval. 4. Know what you’re comfortable with for the monthly mortgage payment. Often what you can be approved for and what you’re actually comfortable with are entirely different numbers! 5. Know about water, waste removal and permit availability. This is where engaging a qualified builder early on can be especially helpful. “I like working with New Era Homes because they build a good, solid home AND understand the paperwork part. We value working with builders who understand the business piece of the process so we made New Era Homes a preferred builder. We appreciate New Era Homes quality, experience and how they pay their bills.” Jackie Westover, Mortgage Loan Officer, Umpqua Bank. For information about building a New Era Home on your own land, contact Sales Manager, Trent Gardner, at 541-330-5463 or visit www.newerahomes.com. For more information about financing your land and/or new home, contact Jackie Westover at 541-312-4813.
the gap they fill between a production level and custom home builder. features that are commonly considered upgrades by other builders. not typically found in homes under $1 million. Premier–which are defined by the customers’ selection of trim options. consistent regardless of the chosen edition. immediate and long term savings. Homes can evaluate and help improve upon it. compromising on beauty, quality, comfort and efficiency,” saysMcKinney. them with the questions they should be asking potential builders. New Era Homes is proud to announce the hiring of Trent Gardner to manage sales across the Central Oregon Region. 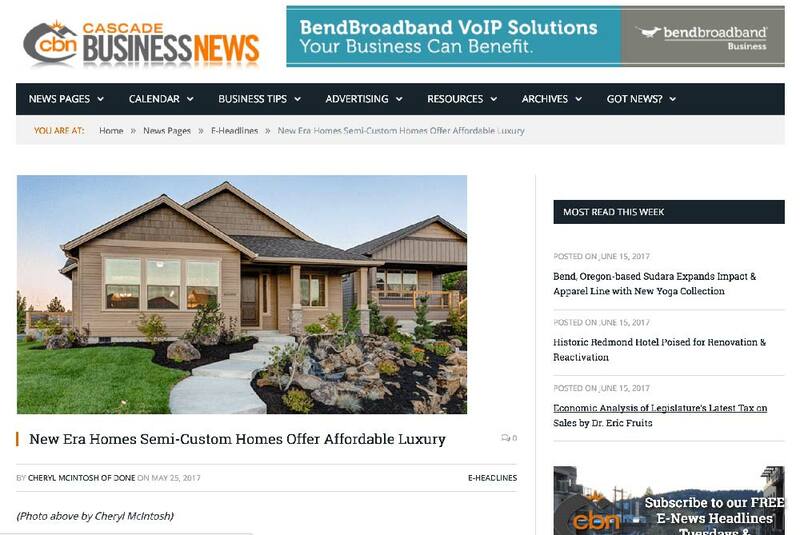 New Era Homes has grown significantly in our 10 years of doing business in Central Oregon. Trent will ensure homebuyers continue to receive hands-on customer service throughout the homebuilding process as the company continues to grow. Trent graduated from the University of Montana with a Bachelor of Science in Business Administration. Prior to joining the New Era team, Trent owned the subcontracting company, Imagine Stoneworks, where he oversaw all aspects of the company’s management and planning. Trent’s in-depth experience as a successful business owner helped shape his philosophy towards long term growth. Since the late 1970’s, building code for new home construction changed to require stronger roof trusses depending upon the elevation of the homesite. In Bend, Oregon, that required that the trusses increase to hold up to 25 Lbs. of snow load for a limited time without failing. Trusses are designed to hold around 12 – 18” of snow for a couple weeks with no residual structural issues. However, this is contingent upon either the snow melting or being removed to prevent ongoing loading of the roof that may lead to structural problems. The problem we had over Central Oregon’s Snowmaggedon of 2017 was that there was 24” or more on roofs for extended period of time. This stressed the trusses but also created the opportunity for ice damming. Ice is much heavier than snow and starts at the eaves and works backwards up the roof line. It eventually works under the shingles and into the attic space. Once in the attic space it melts and drips water onto the insulation and sheetrock wreaking havoc along the way. The minimum effort to counteract this effect is to remove snow from the bottom 3’ of the roof edge. Snow insulates the ice, so removing the bottom 3’ allows the ice to melt first (weather permitting) which then allows the rest of the roof to drain. Today’s code requires use of a product called “storm and ice shield” at all eaves. It is a self healing, asphalt membrane that reduces (but not eliminates) the chance of ice damming entering the attic space. New Era Homes also uses this product in the roof valleys for the same purpose which goes over and above what is required by code. Like any product, storm and ice shield works in normal anticipated conditions and this winter was anything BUT. At New Era Homes, we are always looking for ways to build the highest quality home for the greatest value. Throughout the building process, there are several areas where we exceed the minimum code requirements even when the effects are felt but not seen. We value our home buyers’ satisfaction from the beginning of the process to long after the move in date. Our philosophy is that a quality built home shouldn’t be an “option” – it’s every home owner’s right. There are lots of happy stories with happy people that built their own homes and survived to tell about it. Yet for every one of those, there are 10 more that later wished they had hired a good home builder. This is the story of Milt and Chris Ritter who decided to build a net zero home using their small savings. Their experience is consistent with countless others we have talked to that spent far more time and money then they budgeted for. And without an expert walking them through the process, they experienced immeasurably more stress learning as they went. Building your own home is a rewarding process that can be done hand in hand with a qualified builder. At New Era Homes, we charge a fair rate for our services and avoid unnecessary markups because we want our clients to feel good about the built-in value of their home. Our deep understanding of the home building process means that by choosing New Era Homes as your building partner, you are saving time and stress from the beginning of the project to the end. Here is the link to the “The Green Blues” mini-documentary first shown on Oregon Public Broadcasting. You would be hard pressed to find the HVAC system New Era Homes employs in any home under $1M. Once we develop the shell of the home, we install a lifetime HVAC ducting system using a rigid piping system. The most common practice is for builders to use a flex duct system (think Slinky). Unfortunately, the flex duct delivery system is so poor that the Department of Energy states that it accounts for 30-40% of air loss in a home. This means that you can have the highest performing, most energy efficient furnace in the world, but if you have a flex duct system, you’re still throwing money significant away. It is similar to your heart – you can have an awesome, strong heart but if the veins and arteries are lousy the heart needs to work harder and eventually leads to serious health issues. The same principle applies to HVAC systems. There are two main reasons why the rigid piping system HVAC system is rare to find in houses under $1M. One, subs experienced with this system are hard to find because it is used so infrequently in home building. It is challenging to install and costs the builder considerably more but the payoff to the home buyer is significant. We are all taught that time is money. To build a rigid piping system requires 3x the time investment of all flex systems and the piping material is over 4x as expensive. Buying a new home with a minimally designed HVAC system results in a lower up front cost–but that savings is erased after the first service call to remove and replace damaged or compromised flex duct. The rigid piping system that New Era Homes employs has only 10 feet of flex tails at the very end and is built like a plumbing system. There are no 90º corners which become dead spots for air. The rigid metal piping also allows us to mastic seal and insulate with R/12 insulation; code is only R/8. And finally, we can duct test it. We will not close up the duct system until we know we have less than 5% air leakage. A typical flex duct system can account for 30–40% air leakage. This means your money is flowing out of the ducting and not into your home! To take it a step further, we install multiple return airs in each home so that air moves continuously when the unit is on. This process delivers a consistent degree of comfort from one end of the house to the other. A perfect heart with lousy arteries is obviously not a healthy circulatory system. You have to take care of your arteries and your heart to properly deliver blood flow to the body. Similarly, you need to have both a great furnace and great ducts! Check out House Science Part 1 to learn what you should be asking a potential homebuilder about walls and insulation. On average, there is a difference of approximately $40K in unseen building upgrades between a home built by an á la carte builder and a semi-custom New Era Built home. While not visible to the naked eye, the benefits are seen in overall comfort and in long-term durability. In recent years construction practices have benefitted from the use of science to study the best ways to build homes to ensure long-term comfort and durability. This relatively new discipline is called building science. Choosing a builder and embarking on the home building process can be overwhelming but knowledge of modern building science and techniques will help put you in the driver’s seat. Why is building science important? We are learning ways to build homes with less wood thereby reducing the amount of lumber required while still maintaining structural integrity. We have learned how to build homes to better withstand seismic activity and severe weather climate. We have learned to seal homes better to prevent moisture, wind and fungi intrusion. We have learned how to heat and cool a home using the right sized equipment and the best practices for delivering that air. These are just a few of the things we are learning and implementing in new homes today. The net benefit to the home buyer is a better built home that is more comfortable and durable than ever. In our House Science Series, we will cover specific examples of how New Era Homes uses modern building practices backed by science to build homes that are designed for comfort and longevity. We will equip you with hard-hitting questions to ask potential builders. To begin, let’s examine walls and insulation to learn how modern building science and New Era Homes’ Uncommon Standards work together to build a better home. A well built home begins with a quality shell. The shell comprises the windows, roofing, insulation, structural components, drainage plane, flashing systems and HVAC delivery system. Like most technological advances, building science has taught us so many new things and refuted old-school rules of thumb. As a builder it is important to embrace the new science and change building methods and products accordingly as it advances. To begin with, New Era Homes uses a Knopf brand foam air sealing membrane that seals along the vertical and horizontal cracks of the exterior walls to prevent air leakage. This air sealing membrane prevents air from migrating into the home through cracks in the interior reducing energy loss. This is not a code required insulation application but we feel it’s an important step we can take to ensure your New Era Home is comfortable and efficient. New Era Homes uses an upgraded blown-in blanket insulation system that allows us to achieve an R/25 r-value. Typical fiberglass insulation that comes in batts is rated with an insulation value of R/21. This doesn’t tell the whole story, however, as batts are often split to fit around wiring, switch boxes and piping which significantly reduces the true r-value. Also, batts are pre-cut in length and width so the insulation typically is left short of edge-to-edge coverage. This further reduces the true r-value. Blown-in blanket insulation fills the entire wall cavity from stud to stud, plate to plate, and all parts in between. By using a blown in insulation, we aren’t splitting batts like you would with typical fiberglass insulation. This prevents cold pockets or gaps within the walls. The result is an r-value rating well above building code standards. New Era Homes partners with leading building companies that develop products and techniques that balance cost with best practices according to what modern building science shows us. We have partnered with Tyvek, a DuPont company, to incorporate their building wrap and flashing systems to insure that we have superior moisture protection from the outside. Dupont developed Tyvek and the suite of products that interface with Tyvek to provide superior moisture management. Partnering with the largest and most well-funded company in their category has another significant benefit for the owner; each New Era Home is covered by a 10 year installation warranty against moisture intrusion–a promise you won’t find from an á la carte builder. Most house wrap companies do not make their own flashing tapes or fastening systems. Tyvek is vertically integrated in this space and provides a 10 year warranty when we use their products according to their installation procedures–which we strictly adhere to. Most builders will not talk about this aspect of the home building process because it requires a greater investment in the unseen innerworkings of the home. There are cheaper options to meet code but they do not provide the continuity or protection of the Dupont brands. New Era Homes incorporates an OSB subsiding over the entire framed structure of the home. This provides structural sheer wall, backing for siding, a true secondary moisture plane and it allows our windows full length backing for superior sealing and flashing. To complete the assembly we install the Tyvek building wrap coupled with Tyvek flashing tape to completely seal the sub wall from any moisture that may get behind the siding. Á la carte builders omit subsiding completely and use only one layer of sheet siding–most often using an inferior building wrap as the sole source of moisture protection. Generally these decisions are meant to meet the very minimum code requirements at the lowest cost to the builder–regardless of the best interests of the home owner. There are many less expensive and less effective building wrap options that utilize inferior methods of meeting the code minimum standards. The issue we have discovered is that while these building wraps meet code in a testing facility they are very difficult to install in a manner that replicates the ideal conditions they were tested under. Using Tyvek costs New Era Homes more per house than less expensive building wraps but we feel this is an extremely important element of every home and therefore spend more for a superior product. As a consumer, it is important to work with a contractor that understands and implements the techniques and products that are supported by building science. Ask your builder what building science has taught them and how they have changed the way they build as a result.